As expressed in ancient Chinese medical literature, the universe is qì. Such a grand concept on a cosmic scale may seem remote from the realities of the human body, but through practice the clinician can actually develop a tangible sense of this fundamental universal force. You must also remember that the universe is not only of infinite space, but also of infinite time, the evolution of all things. The human body, like all things, changes and develops. We will explore qì in the human and physiological context as two fundamental types, visible qì and invisible qì. Visible qì is what can be seen by the naked eye as well as what is apparent to the five senses and what can be perceived in terms of cause and effect relationships. This type of qì can be a "solid" substance or a phenomenological event. Invisible qì is comprised of phenomena related to movement of qì wherein a cause and effect relationship is not distinctly evident. At the foundation is bone, which refers to solid structures as bone tissue, vertebrae and teeth, but conceptually includes the marrow, brain and spinal cord. Expressions of the qì concept go beyond the anatomical. Conceptually, "bone" can mean deep, hard, structural—that which is at the foundation of anything. Pathology at the level of bone is more difficult to change. The next layer is sinew, which anatomically is muscle, tendon, and ligament tissue, but compared to bone it is softer, more flexible, and more superficial. This connective tissue layer is a softer condition of visible qì. The next layer is the blood flow. This means the blood, lymph, and tissue fluids. Compared to bones and sinews, the fluids move more easily. At the level of fluids it is much easier to change a pathological pattern than at the tissue level. The skin and hair level includes the mucous membranes. This is the solid qì that dissipates and is most readily expended. It also has the symbolic meaning of "superficial." Perspiration is discharged from the skin with the sensation of heat, but it is not just something dispersed from the body; it is inseparable from qualitative changes in the blood and tissues. Actual substantial organs like the liver and kidneys also have characteristics of different levels of density. In the qì concept model, blood vessels, muscles, and connective tissue are considered organs. Organs like the liver and kidneys are considered to have contents corresponding with the various levels from the surface hair to the bone. Bowels (fǔ) like the stomach and the small intestine, which are lined with mucous membranes, bear a strong resemblance to the skin and other epithelial tissue. Mucous membranes are the body surface of the interior. The epidermis is the yáng aspect and the mucous membranes are the yīn aspect of the epithelial tissues. At the next level, we cannot see heat disperse from the body but we can feel it, so we still consider it visible qì. This "heat qì" is a type of qì that is like a gas that comes from liquid. This layer of heat is also an index of metabolic function reflecting conditions at the deeper levels and not merely a by-product of physiological function. The outermost layer of the body's qì is the aura. If we look in museums at pictures from ancient times, we see the golden glow of the aura, and the bright aura surrounding the head known as the halo, painted behind high priest and saints. This is something generated by the human organism. This type of manifestation of human physiology does not attract much interest among modern people, although its substance has been more or less confirmed by different scientific investigations. There are scientists who are actively engaged in research to substantiate the existence of qì, perhaps as infrared radiation. There are other scientists who are investigating qì as alpha or beta brain wave activity and also those who are attempting to measure qì, or develop imaging technologies to demonstrate this mysterious, otherwise invisible force. This is a very fluid model of the structure of qì. It is important to think of qì as a fundamental force that exemplifies the dynamic and expansive nature of the human organism in its entirety, rather than just a subtle force that is generated by the human body. It can also be conceptualized as a unifying principle that creates a means to grasp the complexity of the body's physical structure and activity. In conventional Western medicine, conceptual models of the phenomenon of metabolism are sufficiently complex and dynamic that they resemble the qì paradigm. 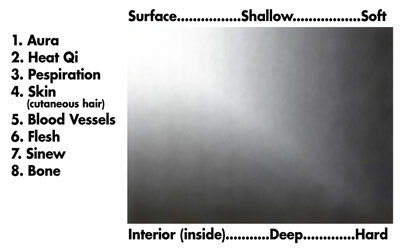 In this model of visible qì there are also different layers of "blood" which exist at different depths and levels of density. This difference in density represents the difference in the dynamic quality of the body's tissues. Accordingly, the physical body is the heaviest layer of qì. Depending on proximity to the surface and shallow regions, the density of qì is lower at the surface. In deeper regions, the density of qì is higher. When the density is higher, the dynamic changes are slower and more permanent. From another viewpoint, there are three conditions of the qì of the body's structure that can be conceptually unified: gas, body fluids, and solid structures. Gases include inhaled and exhaled air; fluids include blood, lymph, tissue fluid, saliva, urine, and sweat; and solid structures are organs and tissues ranging from bone tissue to nerve tissue. There are no clear boundaries between these mutual interactions; they are nothing more than differences in the condition of qì. This viewpoint is also expressed in the ancient classics. This is the qì of the channels and network vessels, and of the zàng and fŭ. Terms that appear in the classics of Chinese medicine, such as zōng qì, wèi qì and yíng qì, distinguish different expressions of qì that can be thought of as structural elements of the human body. These words do not have strict definitions, but can be interpreted based on how qì is explained according to different conditions. There is no scientific substantiation for what is described as the qì of the channels and network vessels, but phenomena related to them can be observed. From the phenomena of obtaining qì (dé qì) patients often report subjective sensations along channel pathways. Visible lines following channel pathways have also been observed on the skin, and some consider these as visible manifestations of the channels. In Chinese medicine each of the major organs can be understood as an actual material organ as well as the functional nature of that organ. This is referred to as the zàng qì and fŭ qì of a given organ. In the case of the liver, for example, there are the manifestations of the function of the actual organ and the expression of the liver as one of the five zàng. In other words, in this context the meaning of zàng and fŭ belong to the yīn-yáng paradigm, a wider conceptual framework than just the anatomical organs. Invisible qì is the movement of qì in which there is not a clear cause and effect relationship and in which its perception is subjective. In the future there may be some means of proof of subjective phenomena and that their existence within the qì paradigm can be made objectively comprehensible. It is unwise to completely deny subjective phenomena that are perceived by some and for which a consensus can be formed even though not measurable or verifiable by technological means. Mind, consciousness (shén), and emotion can be categorized as invisible qì. Mental states and personality traits brought about by the zàng and fŭ, such as "the kidney governs the will," are within the scope of the subtle contents of invisible qì. Buddhist sutras have classified various types of conscious awareness with which humans are endowed in general terms, including the environments ("orbs") of color, sound, taste, smell, touch and reason, the objects of the mind (shén) which are perceived by the consciousness of the eye, ear, nose, tongue, flesh (skin receptors), and thought (sī). With the eyes and ears as sensory organs, which separately perceive color and sound respectively, consciousness is the activity of the mind all-inclusively synthesizing the objects that have been "captured" in this way. The phenomenon of "projection" is taught in physiology. Projection is the process of the sensation of touch being converted by the cerebral cortex, which targets the area of the stimulus, and identifies and localizes the sensation. For example, when the fingertip touches something, the touch sensation is perceived at the fingertip and the localization occurs in the brain. To illustrate further, when a finger touches a rod, the stimulus of contacting the rod is at the fingertip, but the sensation is projected to the rod from the central nervous system. The sensations of sight or hearing are likewise projected to the location of the original stimulus in the outer world. If someone sees an object such as an apple, it is perceived as being located externally just as a sound is perceived as originating from its perceived source. This phenomenon of the senses can be extrapolated to consciousness in general. If a disease focus can be recognized substantially and anatomically, it could be said that the consciousness arrives at the disease focus and that the disease focus is a projection of consciousness to this locus in the outside world with respect to this aspect of human consciousness, this is a function of the area "between" the response within the brain, and the unseen influence exerted by the outside world and thus is the activity of invisible qì. Biological rhythms are another aspect of invisible qì. Biological rhythms are internally programmed tendencies which are often related to environmental cycles and rhythms found in the natural world. This synchronicity with nature is also reflected in the Yì Jīng. The responses of the Yì Jīng to the questions asked are beyond ordinary human knowledge and belong to the area of invisible qì. The power of divination by physiognomy, palm reading, or any other means is also an aspect of invisible qì. Physiognomy of course is related to health but it has also been used to obtain information about the past, present and future of family and business matters. Another manifestation of invisible qì relates to the term of human gestation. These are fundamental mysteries of developmental biology. We cannot grasp many aspects of the process of life—the epigenetic process of how human development originates and takes place, and how we animate our corporeal existence. The human life span is an individual matter. In current theory, DNA programs apoptosis, or cell death, through the four fundamental nucleotides, adenine, guanine, thymine and cytosine. There are superimposed regulating factors that direct this process. This epigenetic system is not understood nor even conceptualized in academic science and belong to the realm of invisible qì. Thus we can see how invisible qì can be causal forces underlying observable phenomena. It can also be information or the layout of patterns that order the structure of visible and measurable phenomena. In summary, qì is something substantial, but there is no conclusive criterion with respect to what it means for something to be substantial. When we examine a patient, we simply do not see the reality of qì with the naked eye. If we develop our way of perceiving, and a feeling for the subtle factors in the background, the reality of qì and how it changes can be anticipated. In the wider sense, the human body consists of qì. To treat people with acumoxa therapy is to treat qì with acupuncture and moxibustion. If you cultivate the habit of strengthening this perceptual perspective, it will transform your vision of practice. This entry was taken with the author's and publisher's permission from "Chapter 2: The Concept of Qì in Acupuncture Core Therapy" in Acupuncture Core Therapy: Shakujyu Chiryo, pp. 15–20, by Shoji Kobayashi; translated by Dan Kenner, Ph.D., L.Ac. ^ see "http://qi-encyclopedia.com/Qi in Traditional Chinese Medicine"